Agenus is the first biotechnology company to use a new and innovative blockchain based technology for financing development of a specific product. This new technology could break the lock on financing of biotechnology firms now held by investment banking firms in the same way that Amazon has devastated most sectors of retailing. This is not the only potentially revolutionary blockchain based product in development that is aimed at countering the wolfpack which could dramatically reduce or eliminate their ability to manipulate stock prices. As argued later in this report, this could have profound benefits for biotechnology companies, their investors and society as a whole. Agenus announced today that it will be the first biotechnology company to use a new financing instrument called the Biotech Electronic Security Token (BEST). BEST provides a way to fund selected products with digital securities that offers an alternative to traditional equity and other financing instruments. It is an asset backed security that will enable qualified investors to directly invest in a single biotech product instead of the company as a whole. It is based on blockchain technology and is made possible by recent regulatory changes. Agenus believes that it will revolutionize the financing of drug development. 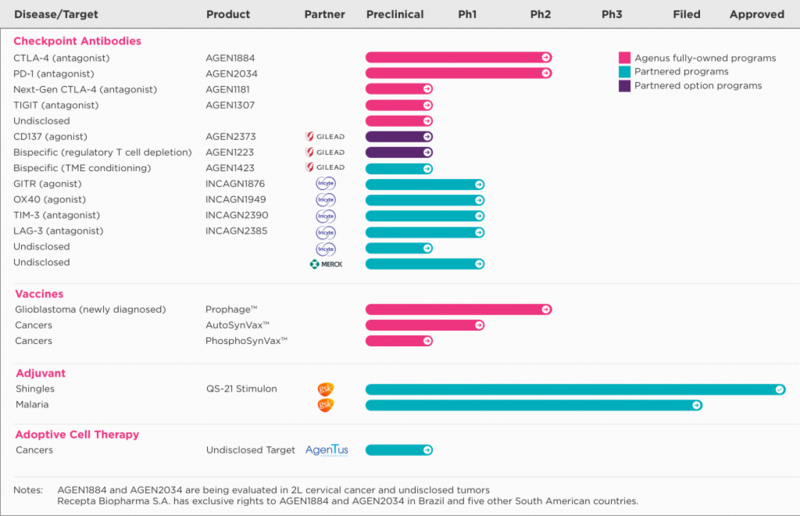 Agenus will use BEST to fund development of its lead product AGEN 2034 (an anti-PD-1 antibody) that is now in pivotal clinical trials. Tokens will be issued that represent a portion of potential future US sales which will give investors a defined return claimable through token redemption that starts with US commercial sales of AGEN 2034. Qualified investors will be eligible to purchase BEST securities under preferred terms in the initial stage of the digital security offering. Agenus plans to raise up to $100 million that will accelerate the development, commercialization, distribution, and indication expansion for AGEN 2034 while providing investors with an attractive risk-return profile. Agenus believes that the biotechnology industry will broadly adopt this financing model as an attractive means of obtaining capital. It believes that BEST will lead to the emergence of a new marketplace for asset-specific securities providing managements with unique funding options for managing risk. Agenus expects to open investment in BEST to qualified investors in mid-February. The offering is being handled by Atomic Capital, a leading innovator in emerging blockchain-based digital securities. It has a digital investment banking platform that uses distributed ledger technology to automate the issuance of digital securities to investors. It also provides access to secondary liquidity on a 24/7 basis. At this point in time, I don’t claim to understand the intricacies of this new structure and the pluses and minuses for companies and investors so I don’t want to offer broad conclusions on whether Agenus is right in claiming that this will revolutionize biotechnology financing. I need to get up the learning curve. However, I am confident is discussing the problem that this new technology addresses. The issuance of stock by biotechnology companies is now dominated by a few investment banking firms and in many cases the primary investors are hedge funds who specialize in biotechnology. The smaller the biotech company, the more the investor base is made up of such hedge funds. For those of you who have followed my work, you know that I believe that there are a group of hedge funds, which I call the wolfpack, that routinely manipulate the price of biotechnology stocks in the secondary market using coordinated legal shorting, illegal naked shorting, algorithmic computer trading and negative propaganda from “paid for” social media bloggers. Again, this activity is directly related to the size of the company, the smaller being most victimized. I believe that this is one of the biggest criminal enterprises in the US and tragically is carried on by certain household name investment banks and hedge funds. This manipulation is not limited to the secondary market as there can also be manipulation in the issuance of securities. There is sometimes an unholy alliance between the investment banks and the wolfpack, especially in the financing of small biotechnology firms. Ironically, the investment banks in many cases can only raise the capital by dealing with the wolfpack, and this comes at a heavy price to the issuing company and its shareholders. Here is how this manipulation works. With the announcement of an equity deal, some members of the wolfpack begin attacking the stock using the same techniques as described for the secondary market, to drive the stock price down. Other members of the wolfpack are then the primary buyers of newly offered stock at this lower stock price. They then demand an additional, steep discount to the stock price and also extensive warrant coverage to participate in the deal. The issuer has no alternative aside from pulling the deal. Upon completion of the deal, the wolfpackers who buy the stock can and often do offer the stock to their wolfpack colleagues who have been shorting the stock. The profits are split and the wolfpack retains the warrants which may be held for the long term or used to hedge against future short sales. This is illegal, but oh well. Many of these hedge fund managers need a new house in the Hamptons or Palm Beach or wherever. Agenus has been one of the most victimized biotechnology companies and I think this explains their eagerness to pioneer BEST. This small company has a broad immuno-oncology platform so that it may have one of the best pipelines in the industry and which can be compared favorably to Bristol-Myers Squibb, Merck and Roche who are the industry leaders. Agenus has tried to fund its pipeline through partnering deals for some of its pipeline assets and to avoid financing in the public market. Unfortunately, in 2018, these deals were slower to materialize and the company was left with an uncomfortable cash position. The wolfpack surmised that the Company would need to raise capital and began their attack. Over the period from March 2018 to December 2018 the stock declined from $6 to $2. This was not all due to the wolfpack actions as the market became disenchanted with biotech and the Company also switched its disease target for its lead development project, a combination of its PD-1 and CTLA antibodies, from non-small cell lung cancer to ovarian cancer. However, it was almost certainly a large factor. On December 19, 2018 Agenus was trading at a stock price of $2.03 and a market capitalization of $233 million when it announced a deal with Gilead that would give Gilead exclusive right to AGEN 1423 and an exclusive option to license AGEN 1223 and AGEN 2373. Each of these compounds is in the pre-IND stage as shown below. You can see from the above chart that these three compounds are just a small component of the pipeline potential for Agenus. Still, Gilead was willing to give Agenus $150 million comprised of a $30 million equity investment and $120 million of upfront cash as well as a potential for $1.7 billion in future milestone payments. Remember that just before the announcement of the deal, the market capitalization of Agenus including these assets was only $233 million. This is a crystal clear illustration of how the wolfpack can drive stock prices to levels that are totally unreflective of the value that a sophisticated investor would place on a Company. BEST will hopefully cater to these sophisticated investors. The BEST financing scheme, Agenus believes, will allow companies to avoid the wolfpack manipulation and gain access to funds needed for development without causing unwarranted dilution to shareholders. I want to emphasize that this is not just an Agenus issue. Virtually without exception, small biotechnology companies are victimized by this wolfpack generated, investment banking firm abetted, scheme to defraud shareholders. If Agenus is right and this becomes a successful, widely used financing instrument, it could be an enormous positive for biotechnology firms and their investors. This could lead to a paradigm shift for investing in small biotechnology firms. Clearly, reducing the power of the wolfpack is a major positive, but it doesn’t end there. The implications may be equally dire for the investment banking firms, which have had a virtual monopoly on financing biotechnology. They have used these funds to subsidize research departments and healthcare conferences which strongly support their investment banking clients. In order to get their stories out, the biotechnology companies must pay to play. Without the support of investment banking generated fees there would likely be no research departments on Wall Street, let alone health care conferences. Commissions on stock trades can not support salaries of several hundred thousand or even millions received by many top analysts in large part due to their ability to help attract and then support of investment banking clients. We could see a time when the flow of information on biotechnology companies is not determined by analysts who owe their salaries to investment banking fees, but by third parties who have no financial incentive to drive their conclusions. I also think that this could have a profund impact on many healthcare oriented hedge funds. I beleive that their portfolio performance. such as it is, is strongly driven by stock manipulation. If they are forced to focus on actual investing, they may not to be around for that long.